When attempting to use the Dropbox App, the authrization thru the API pop up window appears but when the allow button is clicked and the pop-up window disappears, the subsequent window does not respond accordingly. 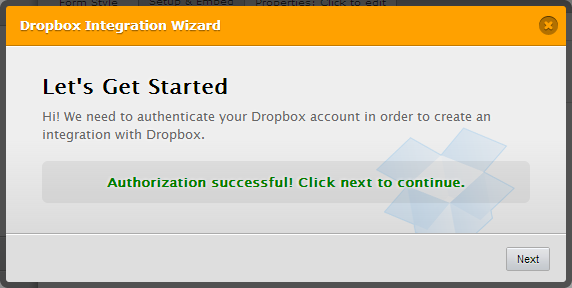 No matter how many times you authorize it, the window does not respond, and still says login to dropbox, not allowing the two services to link. Please help. Hi, thanks for reporting that problem. It can help us to investigate the problem even better if you provide some other infos. Like what browser are you using when you test it. It would be best if you include screenshot about the problem. Is this your first time to use the Dropbox integration? or do you have any existing forms that already integrate? I attempted this integration on both Safari and Chrome. This is my first time integrating dropbox into any forms, so it has not worked for me in the past. Sorry to say but I'm unable to replicate the said problem I'm using chrome. I was able to successfully integrate with Dropbox. or does it stay on 'Authentication in progress...' ? Once the popup opened. You need to 'Allow' the application. Can you please take an screenshot and upload it here? Here's how. So that I can visualize what you are referring to if thats okay with you? I am having the same problem as mentioned above. When I click "Allow" for jotform to access my dropbox the window closes and nothing happens. No check appears. I'm having the same problem in Chrome and IE. Okay I need you guys to do what will I say. This will help us to investigate the real problem. I'm pasting below what is in the Chrome console after the Dropbox pop-up window disappears. For me ... the DropBox integration failed using Safari. Using Chrome, it worked. okay I saw that you guys are using the http://www.jotform.com/dropbox page. Don't integrate your form using that one yet as its buggy. I suggest to use the Dropbox integration on the Form editor.